Click here to see Angela Buckley on The One Show talking about the real Sherlock Holmes. You'll be £19.99 closer to your next £10.00 credit when you purchase The Real Sherlock Holmes. What's this? The detective is Jerome Caminada, legendary policeman and real-life Victorian super-sleuth. A master of disguise with a keen eye for detail and ingenious methods of detection, Caminada is at the top of his game, tracking notorious criminals through the seedy streets of Manchester's underworld. Relentless in his pursuit, he stalks pickpockets and poisoners, unscrupulous con artists and cold blooded murderers. His groundbreaking detective work leads to the unravelling of classic crime cases such as the Hackney Carriage Murder in 1889, secret government missions and a deadly confrontation with his arch-rival, a ruthless and violent thief. Caminada's compelling story bears all the hallmarks of Arthur Conan Doyle and establishes this indefatigable investigator as one of the most formidable detectives of the Victorian era and The Real Sherlock Holmes. As seen in The Sunday Telegraph, The Sunday Express, The Times, The Reading Chronicle, La Stampa and Lancashire Life. Also featured in Discover Your History Magazine, Family Tree magazine & All About History magazine. As featured on Jacqueline Grima's Blog. 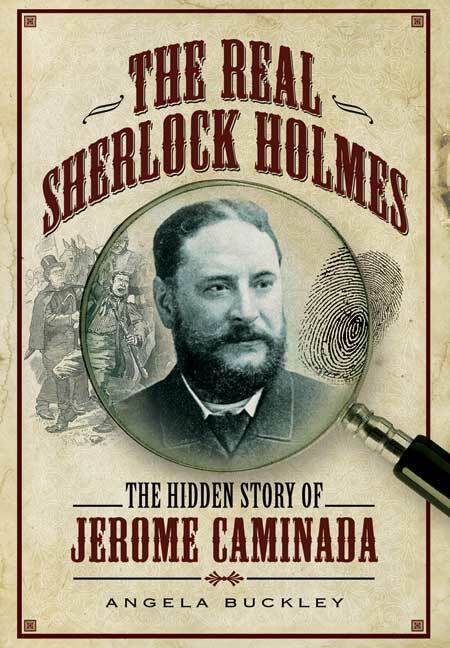 The Real Sherlock Holmes – The Hidden Story of Jerome Caminada written by family historian Angela Buckley, takes us back to Victorian Manchester, and the man said to have been the inspiration behind Arthur Conan Doyle’s Sherlock Holmes. At the same time this book is an interpretation of Manchester’s urban history during the latter part of the nineteenth century. Today much of Manchester looks similar to Victorian Manchester, which to those of us who study and write about the City’s history we would tell you looks can be deceiving. Deansgate at the start of Caminada’s career in the Manchester Police, was a lot narrower than it is today, was home to quite a few rookeries and was cheek by jowl to King Street and St Ann’s Square. Not only was it home to some notorious criminals it would be part of Caminada’s beat. Born in Ancoats a mixture of slum housing and some middle classes along with warehouse and mills Caminada was a member of the large Italian community that resided there. From there he would rise and become one of Manchester’s most important police officers in the latter part of Queen Victoria’s reign. From Police Constable to the rank of Superintendent and served every area of the town and had the reputation of being a brilliant thief catcher. Angela Buckley in her book charts his thirty-year career as a Manchester Police Officer and gives some interesting insights in to both the character of Jerome Caminada as well as some of his cases that he became famous for. She even brings Caminada’s very own Moriarty in a professional thief and very dangerous man who blamed him for being arrested and imprisoned for a few years. This is a fascinating account for all those that like a mixture of social history, urban history and true crime stories, as we see Caminada’s attempt to clean up Manchester. This really is an interesting book well worth reading and then investigating Manchester’s Victorian Criminal history and you will discover a totally other world. Denise Bates writes confidently and with authority on this fascinating topic and her advice is invaluable. She addresses all kinds of readers and researchers, from beginners to more experienced historians and there is something new for everyone to learn. She explains more complex usages, such as data handling techniques, with ease and clarity. I use historical newspapers regularly in my work and yet there was plenty of interesting ideas and new ways of exploiting this wonderful resource for me to try. ‘Historical Research Using British Newspapers’ is indispensable for all those interested in history and I would highly recommend it. An excellent reference work for local and family historians. This is an excellent little volume that will aid both experienced and inexperienced researcher, even though it guides you through using newspapers the techniques in this book are important. An excellent tool for those interested in doing any historical research. This is an excellent, welcome and very interesting book, which serves as a memorial, re-establishing Caminada as one of police history's memorable characters. Caminada will now embody those men whose brave and selfless deeds are no longer remembered and for whom there is no memorial. Author Angela Buckley gave a light-hearted, entertaining evening talk to an audience at Caversham Library…fascinating, lively, informative and funny. Using Caminada’s own words, newspapers and other contemporary sources, Angela Buckley has written a well researched, detailed and readable book which effortlessly brings this period of history to life. I was captivated by the stories of poverty and crime she has woven into the narrative, and of the descriptions of Manchester’s crowded, grimy streets. This is a compelling read – a vibrant account of an extraordinary man, written with a verve that brings nineteenth century to life in all its grimy detail. Buckley claims that Inspector Caminada deserves to be as well-known as Sherlock Holmes, and this book goes a long way to achieving that aim. A book that is highly descriptive of the life and crime in Manchester in the last three decades of the 19th century. It is a gripping tale of one extraordinary detective in his attempts to clean up the Manchester underworld…it provides a highly entertaining and informative insight into crime and crime fighting. The real Sherlock Holmes revealed: Historian finds Victorian investigator Jerome Caminada who was a master of disguise and even had a foe like Moriarty. He was a master of disguise, an expert in deduction and spent decades in hot pursuit of his nemesis. Biographer Angela Buckley commemorates 100 years since the death of Jerome Caminada, the original great detective. A new biography, The Real Sherlock Holmes, by the historian Angela Buckley, highlights striking similarities between the fictional detective and Jerome Caminada, a police constable in Manchester who gained national fame in the 19th century for his crime solving. Highly descriptive of life life and crime in Manchester in the last three decades of the 19th Century. It is a gripping tale of one extraordinary detective in his attempts to clean up the Manchester underworld. A most interesting popular biography of a great Victorian police detective. As seen in Medway Messenger. Angela Buckley has used the memoirs and other published and archive sources to produce a rounded account of Caminada's life before, during and after his police career. Holmes' main methods were deduction and science, Caminada's the more traditional police tools of surveillance, informers and a good memory for villains previously previously encountered. His success was real, not fictional, and is well worth reading about. Although largely forgotten today, Jerome Caminada was one of the most celebrated police officers of the Victorian age. A master of disguise who kept an extensive network of informers, it is said of him that he could recognise a thief by his walk. He solved many of the most notorious crimes in his native Manchester during his 31 year career, retiring with the rank of Superintendent. In her fast-paced and informative book, Angela Buckley recounts his adventures, giving the reader a detailed view of the 19th century slums and the criminals that they spawned. Of course, some of the most appalling crimes were committed by people from an altogether more affluent background. Caminada pursued them with no less vigour. The author believes that Sherlock Holmes must been, at least in part, based on Jerome Caminada. Not wishing to spoil her book for the reader, I will say no more than that she makes a very good case. A highly enjoyable book that deserves a place on the shelves of every student of Victorian criminal history. Jerome Caminada is remembered because he wrote his memoirs and it is refreshing to see a book about a detective that is not London-based. The book uses material from the Greater Manchester Police Museum, newspaper sources and other material, and is well written. The Real Sherlock Holmes not only narrates the life of Caminada, but provides an interesting insight into the general and criminal history of Manchester in the Victorian period. Buckley provides great context to Caminada's story, educating the reader of how it was possible to rise from financial hardship to wealth in inner city Manchester. The book is thoroughly interesting - a leisurely, yet well informed read. After 'decades of silence', Buckley has certainly voiced Caminada's story again. A biography of Jerome Caminada reveals a series of striking similarities between him and the fictional character. It also finds strong echoes of the real detective's cases in plot lines used by Doyle.